After setting the fifth-fastest time in collegiate history in the women’s 300m dash at the Virginia Tech Invitational, senior sprinter Shakima Wimbley won the women’s 400m dash with a time of 51.28 seconds at the McCravy Memorial Invitational meet at the University of Kentucky. This was the highlight of a successful weekend for Canes. 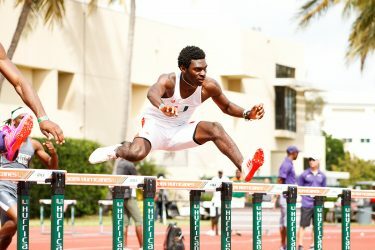 USC junior and Pembroke Pines native Kendall Ellis challenged Wimbley in the first of 10 heats in the event, but the reigning ACC Performer of the Week came away with the win. Wimbley set the NCAA and world-leading time in her performance. The meet featured 10 ranked men’s and women’s teams, including the No. 14-ranked Hurricanes women’s team. Nearly 40 First-Team All-Americans from the 2016 season competed in the talent-stacked meet. Wimbley joined Aiyanna Stiverne, Brittny Ellis and Erin Ford to compete in the first of five heats in the women’s 4x400m relay. Miami went toe-to-toe against USC and Baylor in a host of lead changes. The Trojans, Bears and Canes finished 1-2-3 in the heat and overall, and boasted the three best relay times in the nation. Miami’s time of 3:33.43 ranks fifth in school history. In the women’s 3000m, Gabrielle Hesslau broke the longest standing record in school history with a time of 9:47.06. Diana Adams initially set the record in 1990. Hesslau smashed it by over one second. Sophomore Michelle Athlerley won the women’s pentathlon. The Auburn transfer’s score of 3,984 points is the second best in UM history. Teammate Amy Taintor finished in third place with 3,804 points. Kristina Knott now ranks in the top five in school history for the women’s 60m. Her time of 7.31 seconds earned her third place in a loaded field of 2016 All-Americans and nationally-ranked sprinters. Ahead of Knott were Kentucky’s Javianne Oliver and Texas’ Teahna Daniels, who ran the top-two times in the country. In women’s field events, Erika Voyzey jumped a personal-best 1.78m to finish third in the high jump. Twins Amanda and Emily Gale tied for the second-best pole vault in school history at 3.95m. The men had highlights at McCravy as well. Henri Delauze won the men’s 400m dash with an indoor personal-best 47.42 seconds. The time ranks third in school history. Carlos Mangum was the top collegiate athlete in the men’s weight throw, finishing second with a throw of 20.87m. Andy Fryman of FASTraining edged Mangum for the win by 0.24m. UM will be back in action at the Meyo Invitational at the University of Notre Dame on Feb. 3-4.